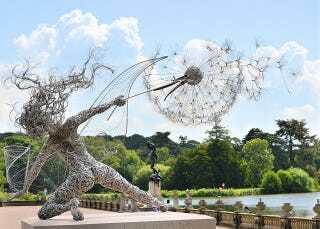 At Trentham Gardens in the UK, you can walk the Fairy Trail and see the many wire fairies created by artist Robin Wright. And the centerpiece is Wishes, a life-sized queen installed earlier this year to commemorate the garden's 10th anniversary. Below, you can see some of Wishes' subjects. A in-depth look at how they were created is over at Wright's website.